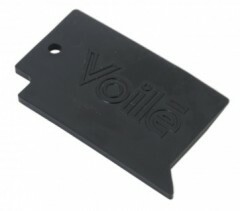 Another Voile accessory you can’t live without. This simple slice of plastic has almost as many uses as the world-famous Voile ski straps. Scrape ice off your skis, skins, goggles, boots, or anything else. The scraper has a pointy corner for poking in tight spots like ski/walk lever mechanisms, and a notched corner for edge work. The scraper is beveled on one edge for a perfect scrape every time (hold beveled side on the surface you’re scraping).